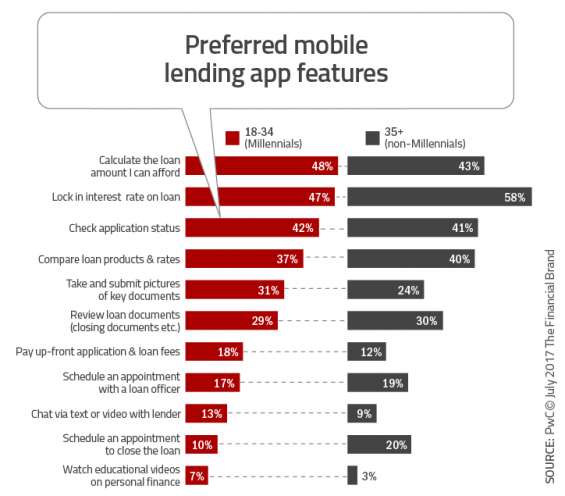 To be a digital lender, banks and credit unions must do more than provide a digital app. Internal lending processes must be transformed to eliminate friction and unneeded steps, with advanced analytics supporting proactive loan decisions. A great deal of discussion has surrounded the importance of building a seamless digital account opening process. As found in the Digital Banking Report, Digital Account Opening and Onboarding, progress is beginning to be made, as more organizations are allowing consumers to open new checking accounts online and on a mobile device. With the exception of a very few progressive banks and forward-thinking fintech firms, however, not nearly as much progress has been made in digital lending. To date, the focus of most digital investments in lending have been to improve the customer-facing digital output, with significantly less attention placed on digitizing the back office. While some of the resulting changes may improve the customer experience in the short-term, these mostly cosmetic changes are easily replicated, and don’t necessarily improve the overall customer experience. Having a digital application is not enough. According to PwC, a financial organization must initially define what is desired from both a customer experience and operational efficiency basis around consumer lending. Next, banks and credit unions must build a digital lending strategy around the following organizational competencies. The path to becoming a true digital lending organization involves five steps. Data-Driven Decision Making: Making the right information available at the right time, to the right stakeholders, in the right format. Artificial intelligence (AI) and machine learning can match customer needs with the right product … proactively. The expectations of the digital borrower have increased over the past several years, mostly based on marketplace offerings and digital experiences in other industries. While the interest rate and closing costs on loans are still primary considerations, the speed, simplicity, transparency and customer service of the entire process is important. 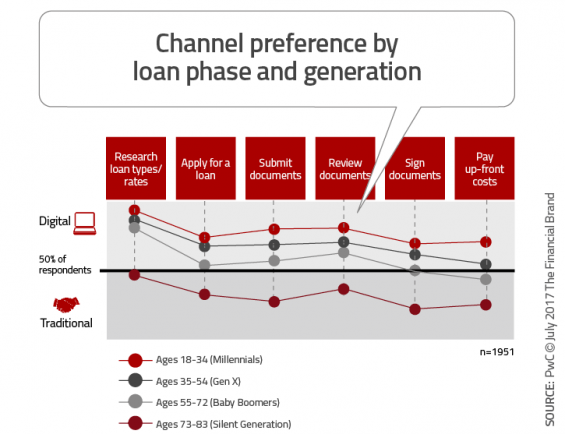 Certain segments prefer human interaction for certain parts of the process, but digital is a requirement for lenders hoping to compete across demographic segments. For the digital-first consumer, there are very few end-to-end mobile applications. There is a great opportunity for lenders hoping to differentiate with a mobile option that can go beyond the application to compare products, see status, lock in rates and calculate affordability. The ability to cross-sell current customers on loan products drives a significant portion of new loans. The difference for a digital-first customer is that they do their shopping online and may select an alternative provider based on the right combination of cost and ease of process. An underused opportunity exists for financial organizations who can provide pre-approval notifications before the customer realizes they need a loan. According to the PwC report, Consumer Lending: Understanding Today’s Empowered Borrower, three out of four demographic segments prefer to be online for each phase of the lending process as opposed to traditional methods, such as in person or on the phone. This is far different from the expectations only a few years ago. The preference for digital lending also extends for all types of consumer loans, including student loans, personal loans, home loans and auto loans. 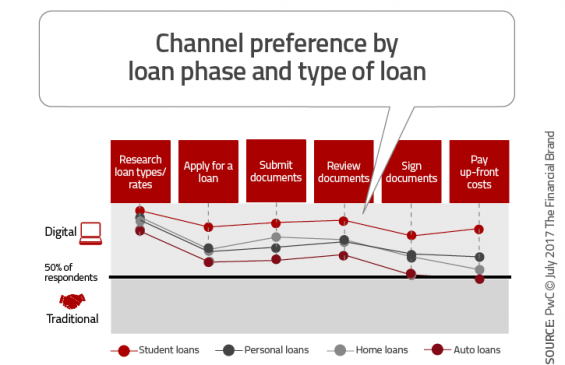 Compared to a previous mortgage study done by PwC in 2013, there was a significant jump in digital expectations for each step in the mortgage loan journey. The chart below shows the mobile app features that consumers indicated they would like to see, broken out by Millennials versus non-Millennials. While some lender apps offer the higher-ranking features – such as the ability to calculate the loan amount that the borrower can afford and the ability to lock in an interest rate on a loan, most of the other features are still not offered by most organizations. The biggest opportunity in the marketplace is the ability to continuously evaluate a customer’s credit worthiness and need based on artificial intelligence (AI), including a pre-approval loan amount on the front screen of the online and mobile banking app and in alerts. Letting a customer know they can get a personal loan at any time with an organization in a matter of seconds can avoid competitive shopping and increase loyalty. To become a digital bank, organizations need to think beyond ‘minimizing the number of clicks’, reducing manual data entry, and improving the speed of decisions. In the PwC report, Getting a Bang For Your Digital Buck, it is emphasized that digital investments need to be aligned to the overall company strategy and desired omni-channel experience. Equally importantly, the report emphasizes that lenders need to develop the right internal capabilities to be able to deliver innovation in a timely and effective manner. The process of becoming a digital lender for the long-term moves investments from ‘digital features’ to a ‘digital mentality’ and process that can support changing digital lending options. It is a major move from investing in just digital output to investing in the digital input that works behind the scenes. 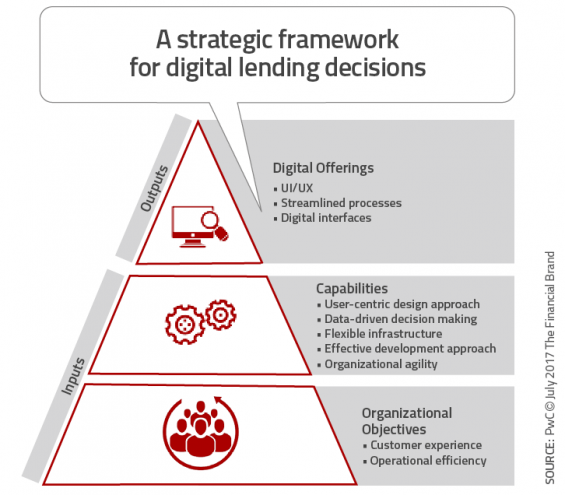 It is a strategic framework for the future of digital lending. As with any digital banking transformation, the adjustment is far more than turning paper into clicks. The transformation must look at all current processes, refining what was done to better accommodate a digital consumer, using data, advanced analytics and artificial intelligence to eliminate steps and improve the process. The key is to avoid recreating bad processes online, instead fixing underlying inefficiencies by letting design lead technology decisions. Change in the banking industry is happening quickly and outside of the control of most financial organizations. It is not just happening in the lending area, but across all product lines and segments. The consumer is asking for more than most organizations can deliver alone. The question becomes – how do we deliver what is being asked for? Digital lenders need to determine if they build their own solution, buy a solution or partner with a fintech firm or another organization to deliver what is required. In most cases, the solution will be a blend of in-house capabilities and vendor or partner solutions. And there is no need to fulfill all of the needs with the same partner/vendor, making compatibility of solutions a major determinant of success. Budget: How much can be allocated to the lending transformation process? Customer Experience: How do you want your organization to interact with your customer or members in the long-term. The most important change in the future will be the application of customer insights and advanced digital analytics (including AI and machine learning) to better understand and respond to customers’ personal needs … in real time. Perfectly executed, the customer will no longer need to apply for a loan in the traditional sense, since the amount of credit available will be continuously processed and communicated to the customer with alerts, notifications and mobile messaging. When the customer accepts a predetermined offer, all supporting documentation will be pre-filled and ready for customer acceptance. The acceptance and any additional interaction may change as well, being supported by chatbots, wearables, voice-first interaction and digitally-augmented human support. With no need to visit a branch office.